12-month subscription provides full access to all sections of the polpred.com portal: for the number of computers from 1 to 9 the price is 590 thousand rubles; for up to 25 — 870 thousand rubles; for up to 80 — 1.3 million rubles; for up to 200 — 2 million rubles; for up to 500 — 3 million rubles; for 1,000 computers — 4 million rubles; plus 1 million rubles for another 1,000 computers. The service is also available to the sponsor who pays. You can also subscribe by making a charitable contribution to the Council of Veterans of the Russian Foreign Ministry. It is also possible to subscribe to information on an industry sector or a country; annual access to polpred.com per one section costs 49 thousand rubles. 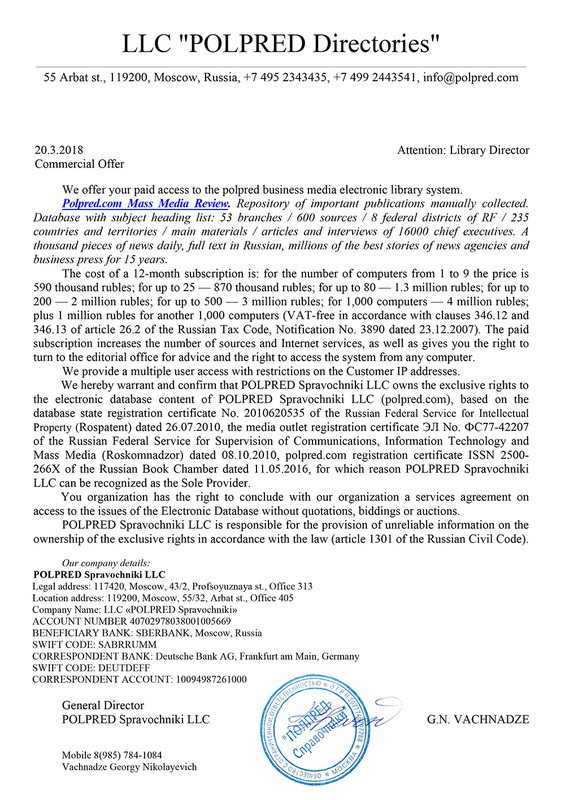 Paid subscription to the entire polpred.com database is available only in the editorial office. This subscription provides more sources and Internet services, gives the right to consult the editorial office and provides access from any computer. Paid subscription enables public libraries to connect within the general package of subordinate municipal libraries. The presence of agreements with compilers of electronic library systems is taken into account in the appraisal of a library. Payment is effected through the bank account of LLC POLPRED Spravochniki, the electronic payment systems such as Webmoney, Yandex.Money, Visa и Master Card, payments are also accepted through terminals, Internet banks, mobile operators (through Robokassa). Legal entities are provided a package of documents: copies of state registration certificates; guarantee of exclusive rights; a draft agreement/state contract, from the sole supplier. The website has the following registrations: POLPRED Spravochniki database (Polpred.com) – Certificate No. 2010620535 оf 21 September 2010, the Russian Agency for Patents and Trademarks (Rospatent); media organization – Certificate El No. ФС77-42207 of 8 October 2010, Federal Service for Supervision of Communications, Information Technology, and Mass Media (Roskomnadzor); Polpred.com – Certificate ISSN 2500-266X of 11 May 2016, the Russian Book Chamber. Interdistrict Federal Tax Sevice Office No. 46 for the city of Moscow on 16 May 2007 issued to LLC POLPRED Spravochniki two certificates: Series 77 No. 008587193 of incorporation OGRN (Pimary State Registration Number) 5077746797288; Series 77 No. 008587194 of registration with a tax authority INN 7727614260 KPP 772701001. Twelve-month access to an industry section, including the full-text online press review from 600 sources and analytical materials for the past 15 years, as well as pdf-format annual publications of the same database + online access to the archives with daily updates. The price of access to each of the sections is 49000 rubles. The number of documents in the daily updated industry sections is denoted. The economies of each of 235 countries and their relations with Russia. Information is given per each country and territory — concerning government agencies, macroeconomics, banks, taxes, the industry, education and science, migration, foreign trade, customs, tourism, trade and investment transactions with Russia, official missions to Russia, statistics. Information from Russian official experts abroad; full-text press review from 600 sources and analytical reference materials. Quoted is the price for a 12-month access to the country site, including online press review and analytics for the past 15 years. Daily update. You can subscribe in the editorial office or through the Internet store. The payment is made to the account from the LLC Polpred Spravochniki. You can subscribe to certain country and industry sector items through the subscription agencies Informnauka, MK-Periodika (they work around the world). These agencies have paper and Internet catalogues of subscription editions, and we have been present in these catalogues for the past 15 years. However, you can subscribe to the majority of our 260 industry sector and country sections only in the editorial office. The subscriber gets online access to the daily updated database section in the Internet and to the archives for the past 15 years - the pdf-format version is also available. The volume of the Agriculture in Russia and Abroad or Business China sections with full-text media features are annually supplemented with tens of thousands of pages. It is several times more convenient to use the Internet database with the search index and settings; pdf format for such volumes is a matter of convenience for those who do not have broadband Internet. Informnauka, Russian and foreign readers’ subscription to polpred.com Media Review publications. Subscription indexes (Excel). The subscribers receive daily news on each industry sector of country on the polpred.com website + archives for the past 15 years. MK-Periodika, , Russian and foreign readers’ subscription to polpred.com Media Review publications. The subscribers receive daily news on each industry sector of country on the polpred.com website + archives for the past 15 years.